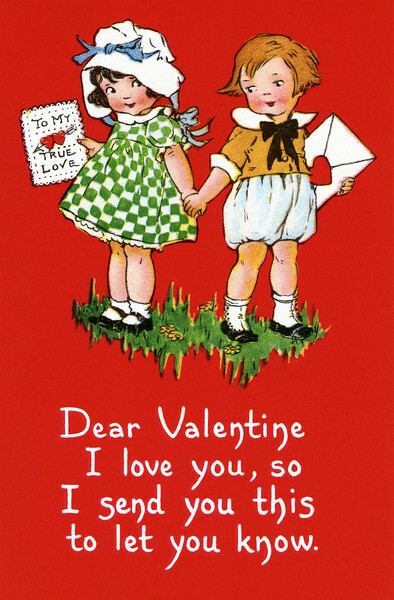 Two little Children giving each other a Valentine greeting - a circa 1915 vintage Valentine greeting card illustration. The "XLarge" and smaller photo sizes are FREE for any personal use (under a Creative Commons license). Click the "Buy" or shopping cart button (above the image) to purchase prints or downloads. PRICING: 1-megapixel Personal downloads are $1.89; 4-megapixel and "Original" (9-megapixel) Personal downloads are $4.95; 1-megapixel Commercial downloads are $9.95, 4-megapixel and "Original" (9-megapixel) Commercial downloads are $49.95; NOTE: Free personal use requires a photo credit to my company, ''The Stock Solution'', and link to that Web site if you use the image on a personal Web site. Do not redistribute digital copies via email -- instead, please link to this web page. Be sure to see all our Vintage Collections.